KINGSTON, N.Y. – A multi-year trail construction project that broke ground in January 2018 and represents a signature element of former County Executive Mike Hein’s envisioned County-wide trail system is re-commencing construction as the winter season concludes. Acting County Executive Adele B. Reiter announced today that the County’s construction contractors have already mobilized to begin work on the former Boiceville Bridge, at the western end of the project area. Early this month, contractors are expected to mobilize for continued construction of the trail between Basin Road in West Hurley and the east side of the Esopus Creek in Boiceville, which began last year with track removal, drainage improvements and sub-surface stabilization. The project, which is known as the Ashokan Rail Trail (ART), will establish a scenic recreational trail running 11.5 miles along the northern edge of the Ashokan Reservoir between Basin Road in West Hurley and Route 28A in Boiceville. The ART will be 10 to 12 feet in width and surfaced with compacted crushed stone that will meet accessibility guidelines for persons with disabilities and limited mobility. Once completed, the ART will be open to the public sunrise to sunset, year-round for non-motorized uses, including hiking, bicycling, running, nature observation, cross-country skiing, and snowshoeing. The ART will provide the first public access to the incredibly scenic northern shores of the Ashokan Reservoir without a special DEP permit in more than a century. The ART will also be a key component of a developing interconnected rail trail system linking the Walkway Over the Hudson to the Catskill Park, which will overlap with sections of the state-wide Empire State Trail announced by Governor Cuomo in 2017 and scheduled for completion by 2020. During construction the trail and surrounding DEP lands remain closed to the general public, except for DEP permit-holders. Unauthorized users may be ticketed by DEP Police, who actively patrol the property. Trail construction in the eastern section, which includes approximately six miles from Basin Road in Hurley to Ashokan Station in Shokan, is expected to be complete in Fall 2019, at which point this section of the trail will be opened to the public. The western portion of the trail, which includes a new bridge to cross the Esopus Creek in Boiceville, is not expected to open until 2020. Detailed information and updates about the Ashokan Rail Trail project are available on the Ulster County website at http://ulstercountyny.gov/ashokan-rail-trail. 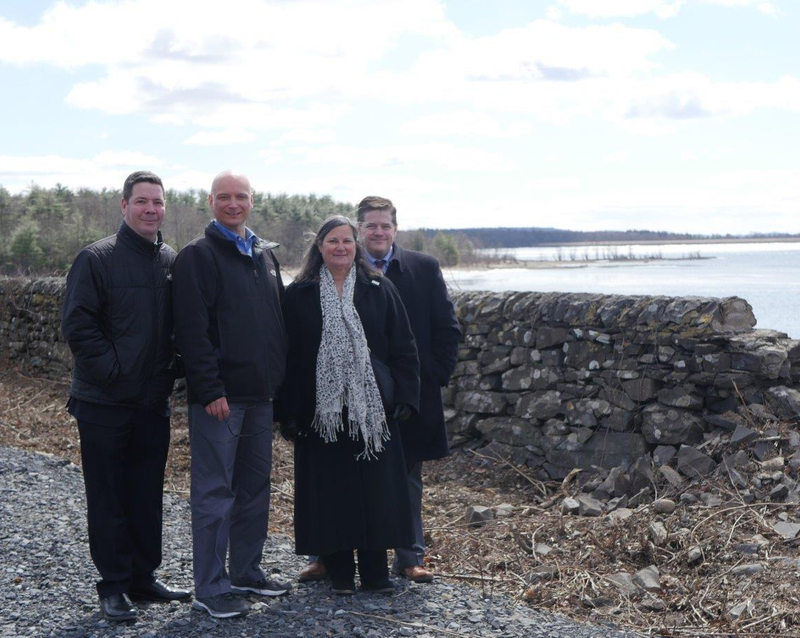 Photo: From left to right, Deputy County Executive Marc Rider, Deputy Director of Planning Chris White, Acting County Executive Adele B. Reiter, and Deputy County Executive Ken Crannell visit trail construction in-progress at the Glenford Dike, in the Town of Hurley.